Michelle Obama: "I really like this job." Gayle King thought bubble: "So do I." If an interview with the First Lady is, indeed, a litmus test for the strength of a new morning show anchor, Gayle King has lit up the internet. 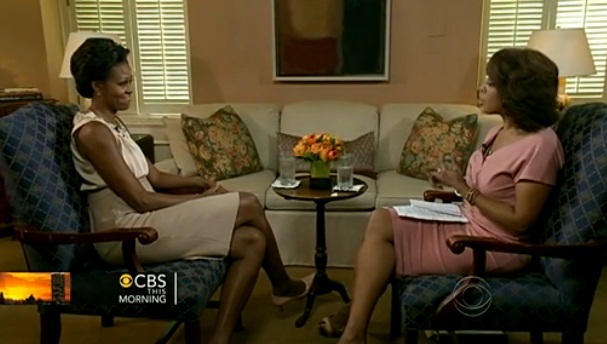 Based on the first two inaugural days of the new CBS The Morning, void of any real news, who knew the woman previously known as the BFF of O would nail the first real news-making interview of the week. To start, there was something smart and intimate about conducting the interview in the First Lady’s office, away from the West Wing and the grandure of the White House public rooms. Michelle Obama’s office , which I don’t remember seeing on television before, felt a bit more cramped than expected, sending a subliminal message of the humility she was trying to express as she and King addressed some of the more sensational content of the new Jody Kantor book about the Obamas. It wasn’t just the interview questions that made this interview particularly engaging. King’s unique poise, warmth and, yes, star power ensured this viewer was glued to the set for part two. Okay, there was one silly question I might have edited out, or around… we don’t need to ever ask if a first term First Lady has been on a learning curve. It might be more interesting to ask questions about the journey of a First Lady’s learning curve. Perhaps closer to the election, King can return to explore in more detail, for instance, how a First Lady learns to best use her new power. Soon after leaving office and before he traveled the world on behalf of his foundation, Bill Clinton spoke to a class at the University of Arkansas, a tiny event that was covered by C-SPAN. With all its trademark bad camera work and bad lighting, the broadcast was one for the history books as Clinton answered questions about his learning curve as President. The seminal moment: when the Joint Chiefs asked to speak with him about his proposed “Don’t Ask, Don’t Tell” policy. It was a terrible meeting for the new president who suddenly realized he was the person in charge and from then on he would call the meetings and set the agenda when he chose. My final note about this interview is trickier: what to do with the First Lady’s surprising and controversial comment that some people are always looking to portray her as an angry black woman, a comment I predicted would be viral by noon. I wish there had been a simple and polite follow-up from King, “Do you want to elaborate on that?” I also wish that comment was explored more at the new roundtable. Trust me, it will chewed on be everywhere else The echo chamber may even rise to the level of First Lady Hillary Clinton’s 1994 charge of “vast right-wing conspiracy” against her husband. Michelle Obama is right that too many writers and political observers are more interested in finding nuggets that fit into their own pre-conceived narrative. Sadly, today everyone gets labeled and stereotyped. Michelle Obama may not be wrong. She unfortunately looked a bit fed up this morning when discussing the new book about her. In a world of 140-character tweets, the burden falls to the interviewer. Without a follow-up q and a, the words now hang out there with an open invitation for global interpretation. It will be interesting to see Michelle Obama can stay in front of #angryblackwoman and prevent a potentially explosive comment from backfiring in such a politically charged, particularly nasty year. As for Gayle King: she’s got us talking… and thinking again.